This semester, we are showcasing the scholarly profiles of the #WeArePublicScholars community on facebook, instagram, and twitter! Public Scholarship students and their Rackham programs, Top row: Kara Crutcher, Social Work and Law; Tonya Kneff, Educational Studies; Nkemka Anyiwo, Social Work and Developmental Psychology; Middle row: Gordon Palmer, Higher Education and Psychology; Kim Ransom, Educational Studies; Vivian Truong, American Culture; Bottom Row: Michael Medina, Education and Psychology; Nicole Bedera, Sociology; Jallicia Jolly, American Culture. We are alive in amazing times. Times in which the lives we live are demanding more from our academic training. Where the intense political upheaval and social strife of our daily lives invite us to critically apply our knowledge and skills beyond elite institutions. Where our intellectual labor and political futures meet at contentious crossroads of community building and systematic exclusion. Where we are bearing witness to innovative ways of knowing, being, and organizing that defy disciplinary boundaries and conventional wisdom. 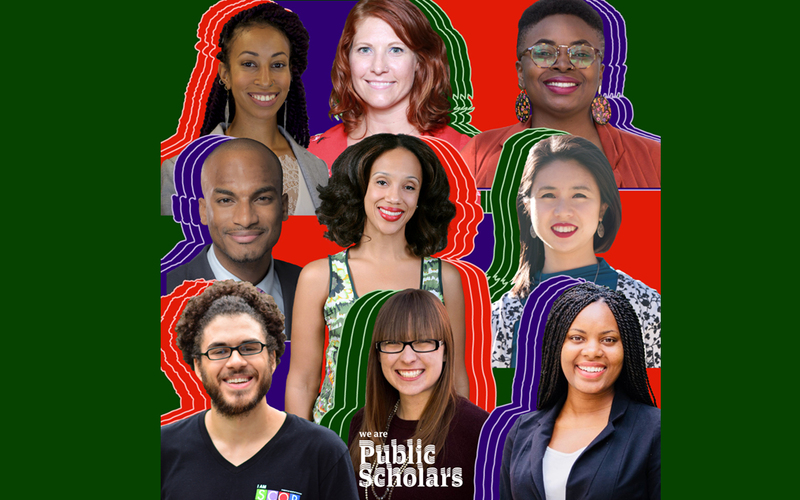 It is in this space that I can claim the public scholar in me/you/us through #WeArePublicScholars – a student-led, intergenerational, and interdisciplinary initiative that amplifies the work of graduate students who do diversity research and public scholarship. Its purpose is two-fold: 1) to showcase the research of graduate students who use their work to advance national debates, public discourse, social policies, and community interventions; and 2) to connect graduate students to intergenerational mentorship and training that model effective research dissemination and application. A critical question centers this initiative: How can graduate students leverage their graduate education to create a world we can thrive in? I came to this question through a series of complex, yet hopeful “arrivals.” These arrivals are shaped by my experiences as a Brooklyn-bred Caribbean immigrant who used communal networks to navigate the regimes of anti-blackness, racialized sexism, and deportation. As a spoken word poet and HIV organizer who has used the creative arts to articulate expansive political visions while community building and disseminating knowledge about health inequities. As a first-generation college and graduate student who sought institutional transformation through mentorship from leading educators who have encouraged me to connect my intellectual work to my ethical and political commitments in informed and relevant ways. Collectively, these routes have cemented the need for research-informed social and political action. They have also encouraged me to connect my scholarly identity to theory and practice that improve the lives of the multiply marginalized. Amidst the euphoria around public scholarship and “DEI,” there remains one consistent thread: a lack of full engagement of graduate students. While I am deeply encouraged by the recent efforts across the university to support the research, dissemination, and application of scholars’ work, there are few spaces where graduate students can meaningfully join this conversation as legitimate actors, thinkers, and knowledge producers in their own right. #WeArePublicScholars offers a space to speak back to these erasures. I encourage institutional leaders to model effective mentorship around public scholarship and “DEI,” and to collaborate to reorganize hierarchical conceptions of “expertise.” This also requires that they use their social capital and power to change the metrics of evaluation that capitalize on publicly engaged “DEI work” while invalidating those who have been doing this work before its widespread recognition. Ultimately, how we respond to these high-stake calls determines the kinds of living and learning environments we will inherit. Given U-M’s transformative history of publicly engaged work, we are uniquely positioned to prepare the future generations of change-makers and political actors. #WeArePublicScholars offers a space for students to think collectively and collaboratively about this preparation. We are hybrid professionals who are actively choosing to have different relationships with academia. We are challenging the rigid silos that traditionally characterize academic life. We understand that the professoriate is not the sole location of scholarship and that the academy is not the exclusive site of institutional transformation. We have asked: Who is “the public” in public engagement and public scholarship, and what does it mean to speak to radically redefine our “publics”? How do we come to know and practice public scholarship at different levels of our career (pre-candidacy, candidacy, post-Ph.D.)? How is the “life of the mind” deeply linked to the daily lives and political futures of differently located humans? What possibilities can evolve from translating and widely circulating our work (for free)? How will the labor of this work be evaluated equitably? Responses to these questions must be intergenerational, interdisciplinary, and transparent, and it must include us. The time is here to expand who can be a knowledge producer and change-maker. To reimagine the kinds of alliances and impacts universities can make. It is in these spaces that the public scholar in me/you/us thrives with an unapologetic praxis that reorganizes the terms by which we live with, learn from, and relate to each other. This semester, we showcase the scholarly profiles of the #WeArePublicScholars community on Facebook, Instagram, and Twitter! Through the online campaign and an upcoming survey, this initiative will gain information about the landscape of diversity research and public scholarship to inform tailored programming that leverages existing institutional partnerships and resources.